Eula Frances Renick, 93 of Munfordville passed away Tuesday, August 27 at the Nashville Centinial Medical Center. She was a native of Hart County and the daughter of the late Claude & Nora Moss Burd. Mrs. Renick was a housewife and a member of the Hardyville Baptist Church. 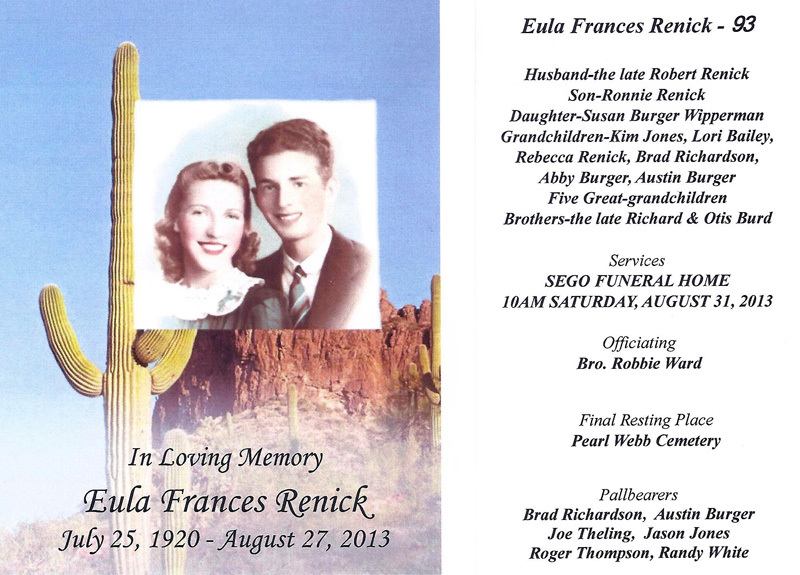 Funeral services for Eula Frances Renick will be 10am Saturday in the chapel of Sego Funeral Home with burial in the Pearl Webb Cemetery at Canmer. Visitation will be Friday from 4-9pm and after 8am Saturday at the Sego Funeral Home. Memorial donations may be made to the Hardyville Bapitst Church.